Adventure seekers can once again enjoy the thrill of mountain biking in Bike Unchained 2. The sequel to the 2015 game, offers a number of new features and improvements compared to the original. There are two main ways to play. In the single-player slopestyle, you’ll test both style and skill riding through five different environments and a number of trails. In the multiplayer version, you’ll battle against three other players in a quest to cross the line first. Riders can participate in daily, weekly, and even special events for prizes. You can also customize their bike with different parts and great. And in the quest to be the best, you can also learn from some of the real pros in the sport who will teach new tricks and skills. 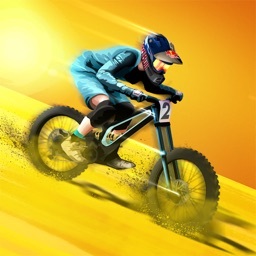 Bike Unchained 2 is designed for the iPhone and all iPad models. It can be downloaded on the App Store for free. There are a number of different in-app purchases available. Learn from some of the biggest names in mountain biking as you can practice your skills or even race against real riders in player vs. player downhill action.